We welcome visits from Primary, Secondary, Nursery and Special Schools to Great Priory Farm. All visits are facilitated and can be tailored to fit your group's needs. We are passionate about the importance of getting children outside the classroom and into the countryside. 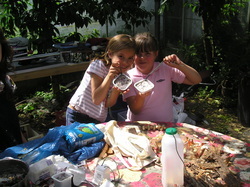 It reconnects them to nature, enables them to learn about where food comes from and is vital to their health and wellbeing. We are lucky enough to have a diverse range of lanscapes and habitats on the farm, including ancient woodland, pasture, arable land, a small river and livestock, all of which can be worked into visits. We also have a classroom space in our thatched barn, fully equpped with loos and handwashing facilities. Visits are facilitated by Emma who has many years experience of working with schools, and who can design a visit to fit in with your curriculum or topic needs. Our farm visits are centred around a guided tour of the arable crops and livestock, tailored to the age and ability of your group. Additional activities and themes can then be incorporated to suit. Breadmaking, Seed sowing, Life-cycles, Green Ernergy, Farming history, Plant identification, Farm machinery and many more. We can link our visits into the national curriculum and will work with you to ensure your visit supports the work you are doing back in school. We are keen to make visits to the farm as affordable as possible, and many groups are able to visit for free via funding that we receive as part of our Countryside Stewardship programme .This is for a standard visit, which includes a farm walk, meeting the livestock, learning about the crops grown on the farm and an activity session in the barn. Other visits are charged at £5 per head for children, with accompanying adults free of charge. Additional activities can also be provided, including work with one of our partner organisations such as Essex Wildlife Trust at an additional cost. We can also provide lunches by prior arrangement.